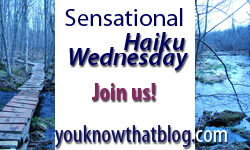 Wonderful variety of foggy atmospheres in each of these haikus! Especially love the image of the “little cat feet”! I love the ‘little cat feet’ line too such a great way to descibe it. Have a fabulous day – thanks for the birthay wishes. I wish I could find a genie in a bottle–a genial genie, of course! Thank you for hosting this. I’m looking forward to reading through everyone’s haiku. I ended up not writing on fog (didn’t see the theme before I wrote), sorry I’m a newbie. Love your use of language, especially “Litte cat feet” and “darkness” likened to a “windshield”. Absolutely fabulous, all of them. Lucidity, is a word I used this morning and your picture of mental clarity is right on. Thanks so much for hosting. All my best! I’m always begging my brain for focus – the verse comes without request ;) Nice! Very nice selection, Jenn on the prompt! I want to thank you for hosting this weekly. Appreciate the work, the challenge and the opportunity to visit so many sites. “Fog” was a good prompt for me, Jenn, but I can’t imagine how I can possibly weave next week’s prompt, “addiction” into a haiku. I guess we’ll see!